Aside from having to explain to a hapless young employee of my local grocery store what exactly matzo is -- and aside from having to respond to the butcher's questions re: shank bone (Butcher hands me little bone, wrapped in plastic; asks, "When is this? Should I get more bones ready?") -- I am no Jewish cooking expert. Within Hudson Heinen's I'm a Goy Joan Nathan. Outside Hudson Heinen's I'm a lady who happens to have married a Jew, who knows just enough about Jewish holiday fare to make a Joan Nathan reference. But please don't let my lack of Ashkenzi pedigree stop you from admiring this brisket. It is delicious, and you should make it. It might be too late to make it for a seder tonight (Passover begins this evening at sundown), but if you're hosting a second night seder, by all means, have at it. The recipe comes from Paula, the mother of one of my best friends in this life. Paula and her charming husband Walter, along with their sons Zachary and Aaron and their fabulous extended family (hi, Cissy! ), invite me and Husband to their home for many Jewish holidays. Even when my best friend won't be in attendance, they often still invite us. I think they feel bad for Husband, languishing down here in this gentile town with no matzo at its Heinen's, but they make us feel like family and I love them even more, I think, than my best friend does. 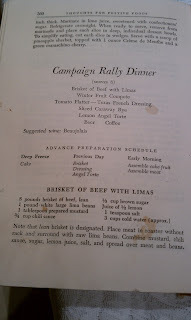 Several years ago I was all, "Paula, I am going to marry your brisket." 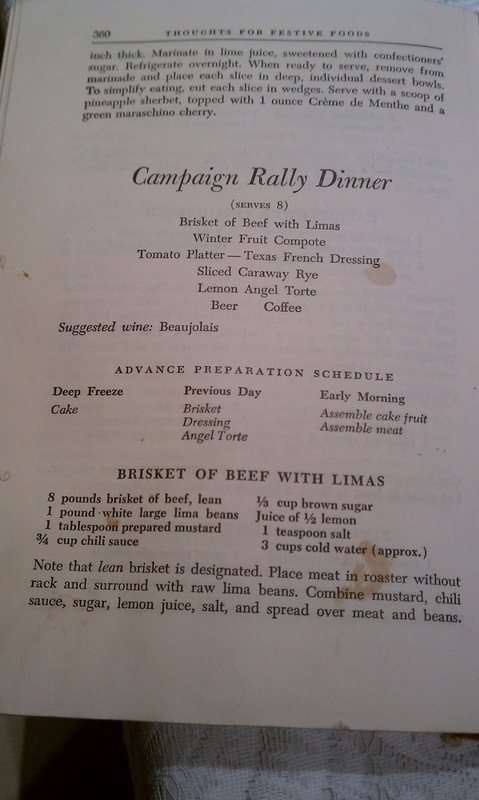 And Paula was all, "Here's the recipe," as she whipped out an ancient tattered stained cookbook to display a recipe for brisket of beef with limas that's part of a menu for a "Campaign Rally Dinner." I snapped a few photos with my phone, and I've been making her brisket ever since. In my house, we call it "Paula's brisket," and nary a Jewish holiday passes without it. This is a fantabulous recipe to make in advance. I do, in fact, recommend that you make it a day or more in advance. I like to make it a day ahead, keep it in the refrigerator, then slice and warm it before dinner. Paula tells me she often makes it far in advance, freezing it, then bringing it to room temperature the day of her seder, slicing then warming it as her guests arrive. Either way, it's a dream, because your main course is done. A note: Husband tells me that, according to some corners of the Diaspora, mustard is not kosher for Passover. We include it in the recipe because Paula does, but feel free to omit if you are of a stricter variety. Preheat the oven to 350 degrees Fahrenheit. Place the brisket in a roasting pan. In a medium bowl, combine 1 T. Dijon mustard, 3/4 c. chili sauce, 1/4 c. red wine, 1/3 c. light brown sugar, juice of half a lemon, and 1 t. kosher salt. Whisk to combine. Pour the chili sauce mixture over the brisket. Roast the meat, covered, for approximately 2 hours. Remove from the oven, uncover, transfer to a baking sheet and let cool to room temperature. Reserve the juices. On the night you will serve the brisket, preheat the oven to 350 degrees Fahrenheit. In a medium bowl, make another batch of the chili sauce by combining the remaining 1 T. Dijon mustard, 3/4 c. chili sauce, 1/4 c. red wine, 1/3 c. light brown sugar, juice of half a lemon, and 1 t. kosher salt. Add the reserved juices from the original roasting of the brisket, and whisk to combine. Slice the brisket against the grain and place the slices in a 13" x 9" casserole. Cover the brisket with the second batch of the chili sauce mixture, then cook, uncovered, for about 30 minutes. Baste the meat with the sauce a few times while it cooks. The goal is to reheat the meat, reduce the sauce, and develop those wonderful almost-burned crispy edges. Serve, ask four questions, devour.